This Monte Cristo Sandwich is the perfect easy breakfast or lunch recipe. 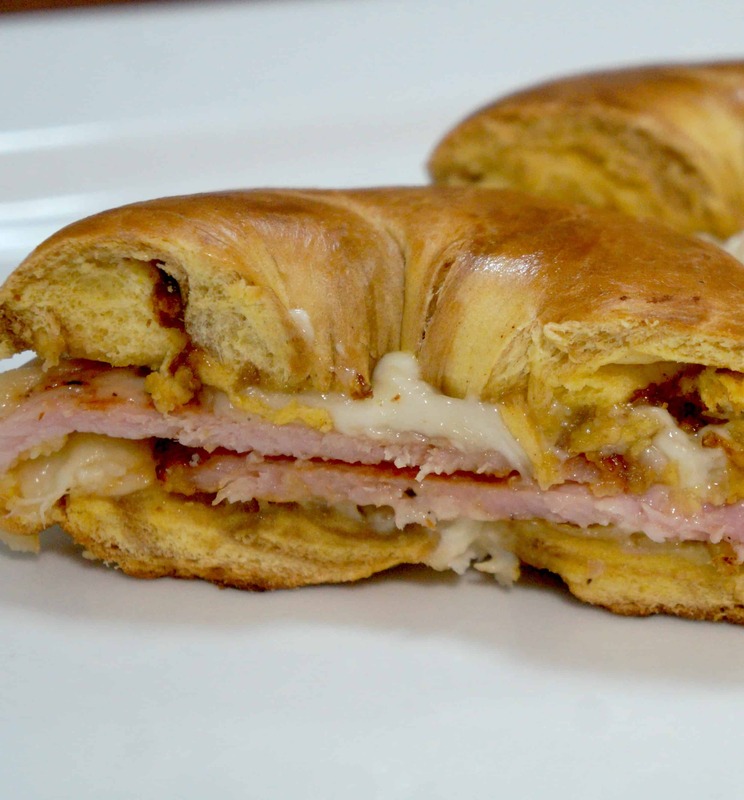 This sandwich is a little different than the traditional Monte Cristo Sandwich. I used bagels instead of bread and peameal bacon instead of ham. When I was grocery shopping this week I noticed that Dempster’s now has French Toast flavoured bagels and they looked really good so I grabbed some. I love French toast. It’s one of my favourite breakfast foods and seeing those bagels gave me so many ideas for new recipes. 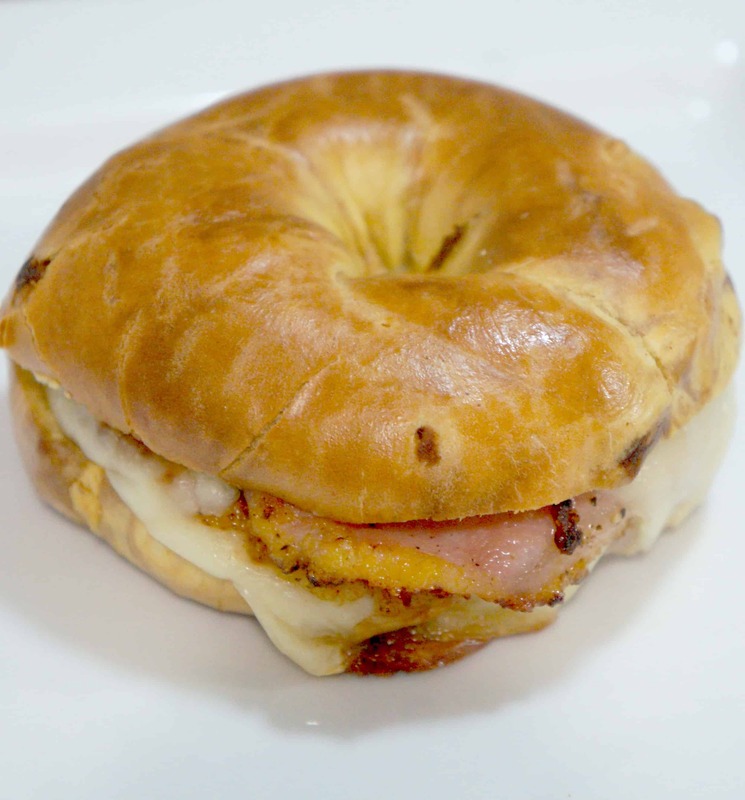 When I think of French toast I think of Monte Cristo sandwiches, so I decided to make some with these bagels. I spread my bagels with a thin layer of mayo just to keep the sandwiches moist after baking. I used peameal bacon instead of ham on my sandwiches because it has so much more flavour. I stuck to the traditional Monte Cristo recipe for the cheese and used Swiss. I baked my sandwiches in the oven instead of dipping in eggs and frying since my bagels were already French Toast bagels. The sandwiches turned out amazing and I will definitely be buying these bagels again soon. I love the taste of the bagels and the combination of the Swiss cheese with the peameal is awesome. The bagels got nice and crispy on the outside but the rest of the sandwich stayed nice and moist. If you are not able to find French Toast bagels, cinnamon ones would work as well. Pull out this recipe the next time you are looking for an easy breakfast or lunch idea! 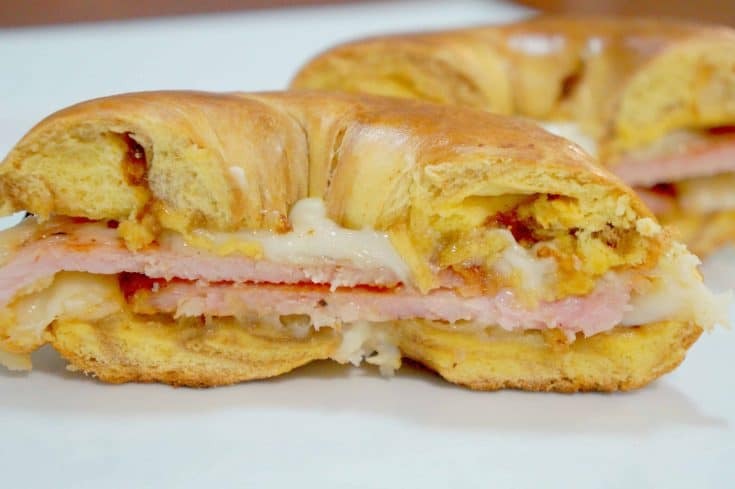 You can’t go wrong with these Monte Cristo Sandwiches on French Toast Bagels. If you are looking for more sandwich ideas check out Bacon and Banana Peppers Grilled Cheese, Sweet Chili BBQ Chicken Sliders and Everything Bagel Grilled Cheese. Fry peameal in a pan one med-high with a bit of butter or margarine. Cook until it is nicely browned on both sides. Open bagels and spread with mayo. Place the 4 bottom pieces of bagel on a cookie sheet. Place a slice of Swiss on each followed by two slices of peameal and another slice of Swiss. Place the tops on the sandwiches and bake in the oven for 10 minutes. Remove from oven and slice each sandwich in half to serve.